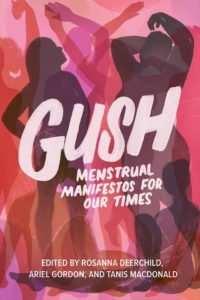 There will be a Saskatoon launch of GUSH: menstrual manifestos for our times (edited by Tanis MacDonald, Rosanna Deerchild, and Ariel Gordon with me as one of the contributors) at McNally Robinson on July 17, 2018, at 7pm. This Saskatoon launch for the Frontenac House multi-genre anthology of writing about menstruation by more than 100 menstruators and former menstruators will feature readings by five of the contributors: Erica Violet Lee, Jeanette Lynes, Yvette Nolan, Brenda Schmidt, and co-editor Tanis MacDonald. All are welcome to attend! This is one of several launch events for the #bloodygreat anthology that are happening across Canada this year. I was recently featured in Synaesthesia magazine as their artist of the month. 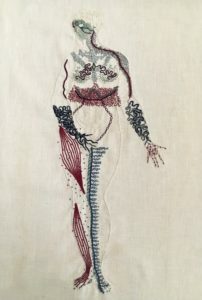 The piece focuses on the embroidery work I’ve done to illustrate my ME/CFS symptoms. I was also the rocur (rotating curator) of @IAmSciArt on Twitter for a week in November and you can see more of my embroidery here (though these links will only work until May 2018). 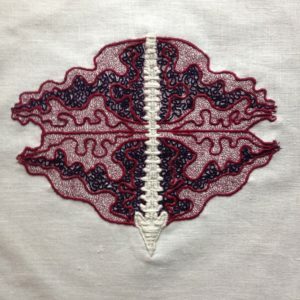 There are two threads, one on anatomy-themed embroideries, and the other on my symptomatology embroideries. I’m currently working on a large anatomy-themed piece that you can check the progress on my Instagram. Healthwise, I’m very slowly improving after a bit of a downturn in the fall because of a stomach flu. I’m still mostly housebound but have been able to drive myself to a few appointments and attend a few family gatherings. If you want to know more about ME/CFS I recommend watching the documentary Unrest, which is on iTunes and Netflix. Hello @IAmSciArt people! Here are things that I was unable to post directly to Twitter. Here’s a recording from my 2006 MA Devised Theatre performance at Dartington College of Arts, Devon, UK. The piece is 11 minutes long.